Thaw your scallops. The quickest way to do this it to quickly rinse them under water just enough to clean them. Drain and pat dry. The shrimp is most quickly cleaned by running them under a slow trickle of water while removing the legs (not quite sure how else to refer to them, but I think you get the point). Drain and pat dry. Place all your seafood into a large bowl. Mince the garlic and herbs. Set aside half of it and throw the other half into the bowl with the seafood. Add the zest and juice of the orange, the juice of half a lime, salt, pepper, and about 3 tablespoons of olive oil. Stir until combined and set aside to marinate. Meanwhile take the remaining garlic and herb mixture and mix in some olive oil, salt and pepper. This is your dipping oil for the bread! Clean your grill and heat it to as high as it will go – the covered grill should get to about 475 to 500 degrees before you start. Make sure you have long grill tongs, as the grill will be hot! As soon as you're ready, mix the seafood again to make sure you have a nice coating of oil and then work quickly to place the shrimp and then the scallops quickly on the grill. Don't move or fuss with them once they are down, as you want a nice sear and some grill marks. 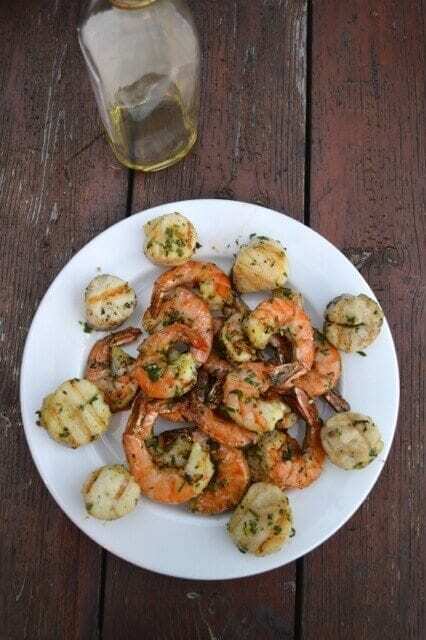 Use a basting brush or spoon to distribute the remaining flavored oil on top of the shrimp and scallops. Turn the seafood once and continue to cook until just cooked through. Grill your bread and serve it along side the seafood and garlic-herb oil.